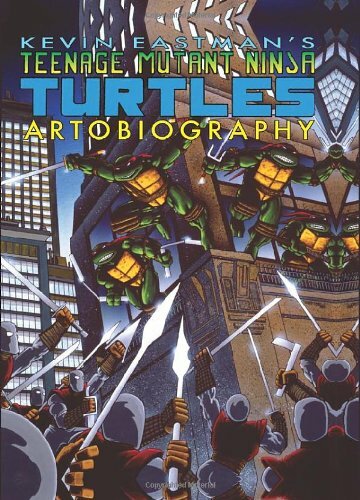 Teenage Mutant Ninja Turtles Artobiography is the origins book at heart. It's quite exciting to read about how it all started. Two guys working on comics not knowing what will happen and next thing they know their work was well received. Kevin Eastman went from cooking lobsters to drawing turtles. Then it evolved into cartoon shows, movies, video games, a life action TV series, and had over 3000 licenses. This book collects the selected thumbnail sketches and panels from the comic books that were launched since 1984. The main bulk of content is from book one to eleven, and then it jumped quite far into the book fifty. Also included are special issues dedicated to each turtle's story, guest artists covers, more sketches, add-on stories for the comics, character designs, and also concept sketches for the first movie. The concept sketches for the movies are interestingly in comic form rather than the storyboard format that we commonly see today. Commentary is provided from start to the end and is a good read into how they actually created the comic. The book is all about the comics so there aren't anything from rest of the franchise. TMNT Artobiography is a wonderful retrospective, a good flashback to the origins.